This summer a pair of the sociable, friendly little chippies—the smallest members of their clan—decided that they would build in a little boxwood tree on the verandah of our house next to the front door through which members of the family passed every hour of the day. The most cheerful of bird neighbors: song sparrows. 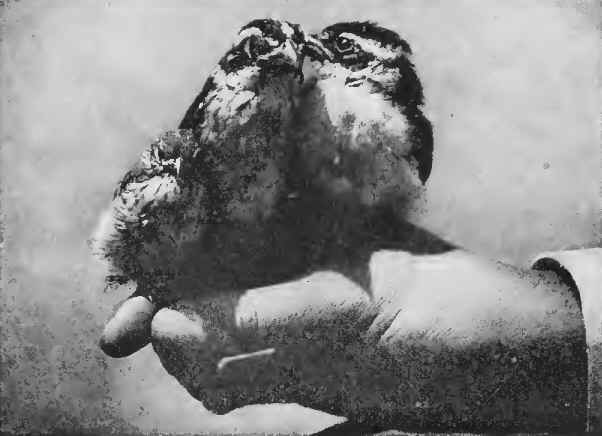 A baby chippy and its two big rose-breasted grosbeak cousins. 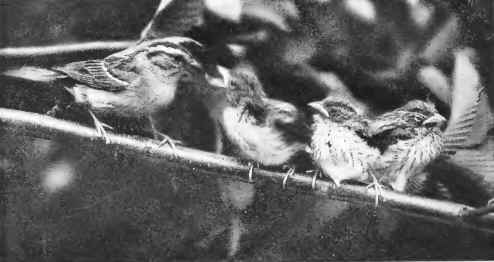 A chipping sparrow family: one baby satisfied, the next nearly so, the third still hungry. While we sat within a few feet of the tree, both birds would carry into it fine twigs and grasses for the foundation of the nest and, later, long horse hairs which they coiled around and around to form a lining. Where did they get so many hairs? A few might have been switched out of the horses’ tails in the stable yard or dropped on the road, but what amazingly bright eyes the birds must have to find them, and how curious that chippies alone, of all the feathered tribe, should always insist upon using them to line their cradles! From the back of a settle, the round of a rocking chair, or the gnomon of the sun-dial near the verandah, the little chippy would trill his wiry tremulo, like the locust’s hot weather warning, while his mate brooded over five tiny greenish-blue eggs in the boxwood tree. Before even the robin was awake, earlier than dawn, he would start the morning chorus with the simple little trill that answers for a song to express every emotion throughout the long day. Both he and his mate use a chip call note in talking to each other. When she was tired brooding, of which she did far more than her share, he would relieve her while she went in search of food. Very often he would carry to the nest a cabbage worm for her or some other refreshing delicacy. The screen door might bang beside her while she sat close upon her treasures without causing her to do more than flutter an eyelid. Every member of the family parted the twigs of boxwood that enclosed the nest to look upon her pretty little reddish-brown head with a gray stripe over the eye and a dark-brown line running apparently through it. All of us gently stroked her from time to time. She would occasionally leave the nest for only a minute or two to pick up the crumbs, chickweed, and canary seed scattered for her about the verandah floor, and showed not the slightest fear when we went on with our regular occupations. We were the breathlessly excited ones, while she hopped calmly about our feet. The chippy is wonderfully tame—perhaps the tamest bird that we have. You may be sure there was joy in the household when the nest in the boxwood contained baby chippies one morning—not a trace of eggshells which had been carried away early. Insects were the only approved baby-food and we were greatly astonished to see what large ones were thrust down the tiny, gaping throats every few minutes. Instead of flying straight to the nest, both parents would frequently stop to rest or get proper direction on the back or the arm of a chair where some one was sitting. In eight days the babies began to explore the verandah. 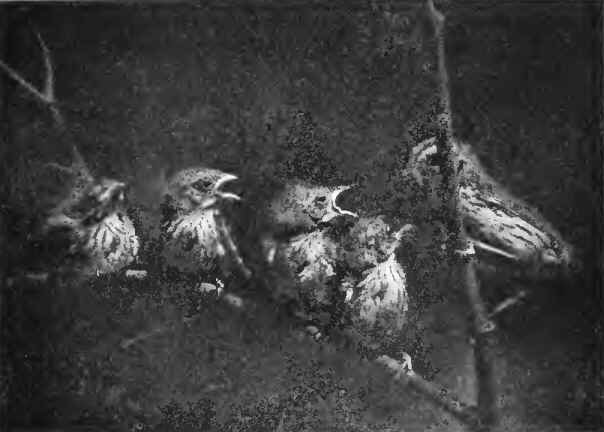 Then they left us suddenly without a “good-bye.” No guests whom we ever had beneath our roof left a more aching void than that chipping sparrow family. How we hope they will find their way back to the boxwood tree from the Gulf States next April!